My first couple years as a mother were an absolute whirlwind. I graduated college, and had my first baby, Hayes, a couple months later. When Hayes was seven months old I found out I was pregnant again and Callum came three weeks early putting them at just sixteen months apart. Even down to Cal’s thirty minute long birth, a birth so fast I couldn’t have had an epidural if I tried, everything in my life was intensely occupied in the care and welfare of these two boys. And now here I am, writing about my baby’s upcoming second birthday. Time has escaped me! It’s raining outside just as it was the afternoon he was born. A cold day in July. When Callum came he was quickly nicknamed “Honeyman” for his sweet and easy going temperament. Now at nearly two years old, he has traded honey for spice. If Hayes is a mini-me, Cal is everything I’m not, and being his mother absolutely thrills me because I truly have no idea what I’m doing with this one. I find myself with stars in my eyes at this little stranger, whose antics are completely unfamiliar. It amazes me how I can have two boys who I love, who love one another, but couldn’t be more different. It reaffirms to me that we are all so unique and each have something amazing to offer the world. I hope you’ll forgive me for the departure from the regular FRYday posts, because there’s really no better way to celebrate an upcoming birthday then with a birth day film! My awesome brother Collin filmed this for us and it is one of my most prized possessions! Jenna also had an unmedicated birth with her baby Jude, and shares it over at In Honor of Design. Nicole shared our Cereal Box Jet Packs tutorial live with Fresh Living on CBS this week. Check out her segment here. 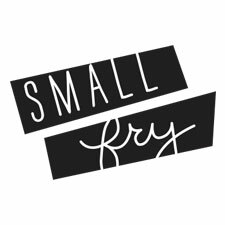 Our friend Jillee had a party for local bloggers and Small Fry and other familiar faces were interviewed for the Daily Dish. Check it out here. Check out more films by Collin at Collin Kartchner Studios. just cried my eyes out em. always have loved this film. i remember visiting you that day you had Cal. he’s touched all our lives so much. also my favorite part is when the hypoglycemics join together in a moment of eating. This is stunning. It is crazy how fast the years go by and yet sometimes it is so hard to cherish the little (and hard) moments. This video is such a great reminder. Thank you. Time flies, you’re so right. I am trying to be better at basking in the hard and wonderful moments. I love your story because it is a little like mine. My babies were both three weeks early and they are 16 months apart as well. My son is so much like me, but my second child, my daughter, is ‘everything I am not’. This video is so beautifully done. Bravo to your brother, and bravo to you, momma. How crazy to hear such a similar story, I love that about blogging. So beautiful. I loved it. And I just cried! What an amazing video. Oh’ and your hair! How in the world did you get that braid in and look so good? beautiful! Incredible. I certainly would have hired your brother to film both my boys, what an awesome treasure! I know I wish I had one with my first born!! Thank you so much for posting this. My boy is now 2.5 years old, and I remember the day he was born so vividly. Those alert newborn eyes…there is nothing so special. Thanks for the reminder. Such a special day, I am glad I could share it!! aubry shared this video with me right after cal was born, and it was my first introduction to emily. i cried then and now. such a treasure. Love this! Thanks for being so sweet to me always, Andi. Beautiful video. I teared up a bit at the moment where you shook your head no during a contraction. Such a powerful display of love and strength. It also makes crave another newborn. I already have 3 & I go back and forth feeling done & not done. But this definitely made me feel “not done”. I go back and forth too, it’s surprising that watching myself go through that makes me want another one. Just shows how amazing it truly is! I cannot watch a birth video without crying (MTV’s 16 and pregnant will send me into hysterics), and your Cal’s was beautiful. What magic- those first surreal hours with your new baby. Thank you for sharing! I cry at every filmed birth story I’ve ever seen. It’s just such a huge moment when they take that first breath. Thanks for watching! So Sweet. It always makes me cry and so excited. Best three days of my life. This video is so beautiful! What a treasure this is. The music is perfect too. It’s a long time favorite song of mine, felt suitable to put it to one of my favorite days, too. This is BEAUTIFUL!! My husband and I were watching this and the room got really quiet as our minds went back to that moment. Our newborn is only 3months, but he’s growing so fast. Such a special memory to have. Blessings to you and your fam. what a sweet baby! i have no idea how you did that sitting down. i had an unmedicated labor (4.5 hours) and definitely had to be up walking around trying to get through the contractions. go you! were you positive for group b strep? i’m assuming that’s what the IV was for? i had to have that, too. it was the worst part of my whole experience! I had the craziest labor ever! I went in for my 37 week appointment and was dilated to an 8 but not in active labor. You’re right about Strep B, and they were anxious to get me the antibiotic so they sent me to the hospital, ran it for four hours and I STILL wasn’t in active labor. Thats when they broke my water, and 20 minutes later Cal was born! I didn’t even have time to think let a lone stand up. It was nuts! My first baby Hayes was similar to yours, 3 hours long and I walked around as long as I could, but for some reason as soon as my water breaks I feel stressed to just get in the bed and hunker down. I actually had Strep B with Hayes too, I’d love to avoid the IV sometime in my life haha!